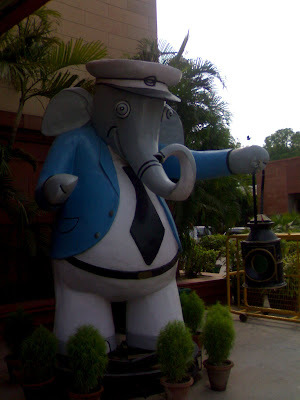 This is "Bholu", the Indian Railways mascot adopted on the occasion of the department completing 150 years. This particular statue stands gaurd at Rail Bhavan, 1, Raisina Road, New Delhi. It is a very cute elephant who is dressed in the official garb of the Railway guard.